Coco-Lite is the new and fantastic product brought to you by Swift-Lite International. -- Natural - Sustainable - Ecological. Coco-Lite is 100% natural charcoal made from coconut shell. No wood or trees are used in the manufacture of this product. Coco-Swift charcoal cubes burn 3 times longer and produce 80% less ashes than traditional lump-wood charcoal. 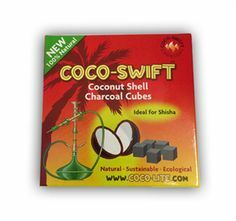 Coco-Swift charcoal cubes are economic and ecological. 1 Kg/2.2lbs when packed. SAFETY INSTRUCTIONS: Only light and use the blocks in a well ventilated room. Once ignited this product is extremely hot and should only be handled with tongs. When the block has finished discard into water to ensure that is completely cooled. WARNING: When lit this product will cause a fire if left in contact with paper, fabric, carpet or any other flammable material. DO NOT allow minors under the age of 18 to handle or use this product. When lit contact with the skin will cause burning and injury. Made in Indonesia under supervision of Swift Lite Charcoal International, Established in England 1957.